America is a melting pot. Look into the average classroom and you’ll find young people of many different cultures interacting and learning together but only a select few of those young people will have their culture reflected back at them within their school systems. In today’s climate, having pride in who you are holds more value than ever. A healthy amount of cultural pride is the only defense against internalizing standards of beauty and goodness that are impossible for most of us to achieve. The lack of education about varying cultures and heritage has caused many to conform to inherently exclusive ideals portrayed in all forms of media. Having grown up with the lingering effects of this, Ghanaian American and Dallas resident Paakow Essandoh partnered with fellow University of South Florida student George Kariuki in an effort to trace their roots. From there, they came up with MIZIZI, a lifestyle brand that embodies the spirit and strength of its African ancestors. As they recently restocked their Wakanda themed gear on Juneteenth, we wanted to chop it up with Essandoh on their release and much more. Check it out below! 4MP HyAli - Yo, big ups on the success of the recently restocked Marvel x Black Panther collab, that’s truly a blessing, bro. 4MP HyAli - No doubt! OK Paakow, the creation of MIZIZI. What was it that kickstarted the creative process? Paakow - I was 20 and a junior at the University of South Florida at the time. That’s where it all originated. Me and a homie name George Kariuki (left MIZIZI to pursue other business endeavors, much love, still a supporter), began the preliminary stages. The dope fabrics he’d rock sparked inspiration, and I originally envisioned MIZIZI offering everything from head to toe. Through the site, Maker’s Row, I then connected with manufacturers who could assist throughout the entire project. Some of them told me it was outrageous and wasn’t feasible, which led me to New York in order to find another manufacturer. On a train to Harlem, it kind of hit me, and I wondered if I was doing too much? So we refocused on how to make this all work. What would be the most popular? What would be the easiest target in the market? Right around that time, baseball jerseys were making their comeback and that was where we devoted our attention and expanded. 2015 was when it truly started and now we’re here. 4MP HyAli - The college experience tends to spawn ideas for up-and-coming businesses. How was your experience as a Ghanaian American? Paakow - Honestly I don't know the language, I’m as African American as it gets. In Tampa, Florida is where I began embarking on who I am. Who is Paakow? For the first time, I was learning about myself but in a brand new state and everything. I had my share of difficulties making friends early; I can’t hoop, can’t freestyle, no good at 2k, I was kinda assed out haha. Also, USF is a big international school, a lot of students straight from their home countries and people seemed clicked up within their cultures. Seeing this firsthand made me want to bridge the worlds. 4MP HyAli - Why go to Florida? Paakow - Well I’ve been here since I was 10 years old, raised here so I didn’t want to stay in Texas for school, I needed something new. Had two homies in the state of Florida already too. The difference I noticed between the two is that I found that racism is slightly more subtle in Texas, definitely more of an alienated vibe in FL. 4MP HyAli - African pride is the driving force for MIZIZI, which in Swahili means “roots”. In your opinion how has African pride & the appreciation for ones blackness shifted in the US during your lifetime, especially in today’s current climate? Paakow - Growing up I shunned my African roots, wanted nothing more than to be like the surrounding white boys. I started seeing more pride in African culture once I moved to Texas and appreciated it more and more the older I got. Definitely internalized plenty of booty scratcher jokes throughout my younger days, but as I became more aware of who I was, the jokes got old. Now in recent years, it feels like an African renaissance. Definitely more integrated in media which is the result of many things. Generations before us were more by the books; as opposed to the millennials who see opportunity and can recognize their path isn't the same as their parents, saw the path isn't the same path we need to go down, especially pushing the creative arts. 4MP HyAli - I’m of Sudanese descent, so you know I’ll be proudly adding their baseball jersey to the collection very soon, what’s your favorite product currently being sold www.mizizishop.com ? Paakow - Man this is tough! I'm a fan of everything MIZIZI. If I had to choose one to speak on, it would be the first sample of the Eritrean baseball jersey. Red sea print throughout the jersey, golden wreath on each sleeve, plus the colors; makes me feel like royalty. 4MP HyAli - If there were a massive basketball tourney that consists of only African countries, who would be in your final 4 & why? Paakow - Ghana of course, Nigeria, Congolese shout to my Biyombos, and last I’ll put the Kenyans in. Think that would make it interesting since they are known for being very long winded, might be tough to keep up with them for four quarters. 4MP HyAli - Haha saw you held a movie night initiative February 2018; first 200 people in MIZIZI gear had the opportunity to see Black Panther free of charge. Do you have other community plans in the works to look for? Paakow - Can’t say too much at the moment . At MIZIZI we don’t like taking the normal approach, like to tip it sideways, no cliche moves. Based off of the alignment of does it fit our branding and where we have a strong customer base, we want to provide something new and different. For the movie night. it all came together and just made sense. So we reached out to AMC to put on for our people. 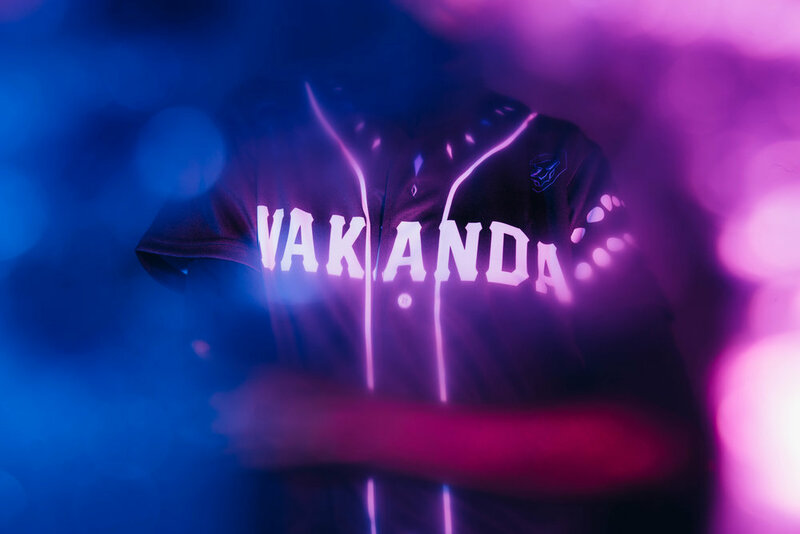 4MP HyAli - The MIZIZI x Marvel Wakanda Forever baseball jersey is a monster hit & recently restocked for those who weren't able to get theirs the first go round. Did you envision this product being as successful/popular as it is? Paakow - Yes, I did. It was sparked by customers to be honest. What should I wear for the culture? So the idea came about quickly and the next step was, how can we make that happen? After doing research and making a map in my mind, I plotted it out, started from the initial disconnect and then made designs shortly after. I didn’t get the best response off the bat. I can get obsessive when it comes to my work so created a whole campaign and everything. Last time I was this confident was when I first started this company. Still think it can be a lot bigger and it’s still getting exposure. I have to take advantage of the time, because this particular window won’t last forever. 4MP HyAli - The Afrolatinx & Marvel collection established more diversity with MIZIZI, how do you plan on continuing to build on that, what’s next to come? Paakow - Introducing more countries especially with the popularity of the World Cup is a priority and in the works. Working with designers from the actual countries and being in tune with the customs and culture is something that is a focus moving forward. As we grow and continue to expand, we would like to continue to receive suggestions, speak up let us know what country you want to see represented you want to see from MIZIZI next! 4MP HyAli - I’m not going to front I did a lil research on the company and for a momma’s boy like myself, seeing “MIZIZI Mama” working so close with the company is something that genuinely makes me happy to see and appreciate. What influence has she had on your overall work ethic/drive, and how has she put her motherly touch on the company? Paakow - She was our angel investor and the sole reason it was all possible. Two years prior I was homeless, and didn’t have the funds to start anything myself. Throughout my childhood she witnessed me pick up a lot of things and that I never truly followed through with or completed. It was far from a easy decision for my mother, she sought out advice from family and friends. Currently her role consists of basically peeping everything, looking out for all, checks social media. The aspect of having fam and friends working with you makes you wanna go that much harder at the end of the day. 4MP HyAli - I love it my brother. Thanks again for your time and truly enjoyed the conversation. Wish you nothing but peace and success moving forward with MIZIZI. Paakow - Thank you bro, likewise it was my pleasure. Make sure everyone looks out for the new releases we have coming on Juneteenth (June 19th).